becoming an icon of Hawaii's glory days." into old age. . .
Half of the Pacific runs through my home. 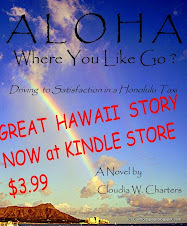 If I had stayed in Hawaii I would have been same same Cloudia, retired and at the end of a lot of stories. I would have been part of the community, of our small community anyway, and a kupuna* bearing memory and local stories & knowledge. But we came on an adventure. We started a new beginning, a new chapter. And that keeps you young, fresh and evolving. And not at the end yet. But just like people from Earth who make a home on the moon, I need to visit the home planet, to keep the connections fresh and real, not receding to memory. Then after some R&R I can come back to my exciting new adventure, still a Hawaii person in Marin, not a haole* snowbird who comes to Hawaii from time to time and sees only the outside face. I know where the family stay. It is always nice to be able to returnn to your roots. Nice photos. Thanks for participating Cloudia. Nice hotel header. I know it´s about murals, but to be honest, Local Guy with Dog made my day. Seeing the world is a great adventure! Love the pictures of Hawaii and your musings on your life. Thanks for taking us along for the ride. The ki'i is particularly eye catching. I am so glad that you could go home. And love your attitude to life. I've spent 70 years collecting stuff. Now I need to get rid of it before my kids have to deal with it. I'm glad you had a great visit, Cloudia! The facade of the hotel is wonderful. Love the decor! I had a Hawaiian beau once who called me haole girl.